One of many great things about Zato is the fact how easy it is to plug into it new data sources and input methods triggering one's SOA/API services. 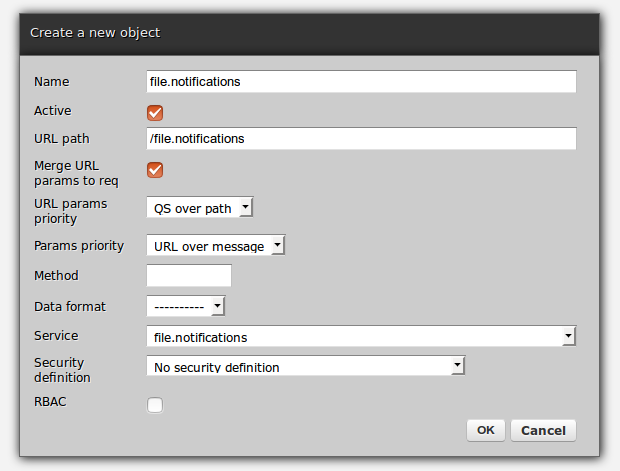 For instance, Zato 2.0 does not have a web-admin GUI for file notifications but it is still possible to listen for new or updated files in directories of choice and invoke services each time a new event arrives, e.g. when a new file is dropped into a directory, effectively creating a new channel type in addition to what Zato comes with out of the box. This is exactly what the script below does - it uses watchmedo, part of the watchdog package, to listen for events in a given directory. Each time anything of interest happens in that directory (here - in /tmp/data) a Zato service defined below is invoked with a path to that item of interest provided on input. It's entirely up to that service to decide how to handle the data in each file - one can decide to deliver it to any of outgoing connections in Zato using, for instance, AMQP, SMTP, FTP, ElasticSearch, Solr or do anything else that is required in a given integration scenario. Such a service needs to be mounted on an HTTP channel, as below. If you have not done it yet, create a directory /tmp/data and start the watchmedo script above before continuing with the next steps. As of today, the mailing list used by Zato has been retired in favour of the new forum that will let us provide a great community experience. All of the contents of the mailing list has been already migrated to the forum so all the terrific questions, answers and ideas posted to the list are still accessible in the new forum. Speaking of the migration - a Python tool has been written to automate the process and its source code is published on GitHub. This can be taken and forked at will with the hope that it can serve as a source of inspiration on how to use the Discourse API from Python code. Since its inception, Zato has always offered hot-deployment, which means that it is possible to update code of one's SOA/API services without restarting servers - simply upload a new version of a given Python module and it is automatically distributed to all servers forming a cluster. The next major version will extend it to user configuration as well - so you will be able to edit any .ini config file on any server and all changes will be propagated to other servers each time that file is saved, just like with services today. In Zato 2.0 a little piece of code such as the one below can be used to achieve the same effect. Essentially - after updating a config file, for instance user.conf you need to invoke the 'util.config.reload' service, can be either directly from web-admin, command line or over HTTP, AMQP, ZeroMQ or any other channel. This will publish an internal message to all servers prompting them to re-read all user-provided configuration files. In this manner, there is even less need to restart servers - after all, why restart the whole server if only a file or two changed? While there had been always a plethora of options to install Zato with, under RHEL/CentOS, Ubuntu, Debian or Docker, now a newly added chapter of the documentation explains how to install the Python-based integration platform from source code as well. This is essentially two commands, one to obtain the code from GitHub and another to run the installer. So here you have it - installing Zato from source - surely will come in handy if you'd like to try out Zato in a system for which there are no pre-built packages or in other situations in which case please drop an email to info@zato.io telling us where elsewhere, in addition to already supported systems, you would like for Zato to run. Thanks! A newly released zato-enclog package lets one store Python logs in an encrypted form making it a great fit for environments that cannot keep clear text form of data such as PII (Personally Identifiable Information) in HIPAA-compliant applications. The package comes with command-line tools to decrypt files, including a command that mimics tail -f functionality to watch decrypted logs as they grow. Usage examples from Zato .. Using tailf -f vs. enclog tailf. The former will show logs in encrypted form whereas the latter will display them decrypted.